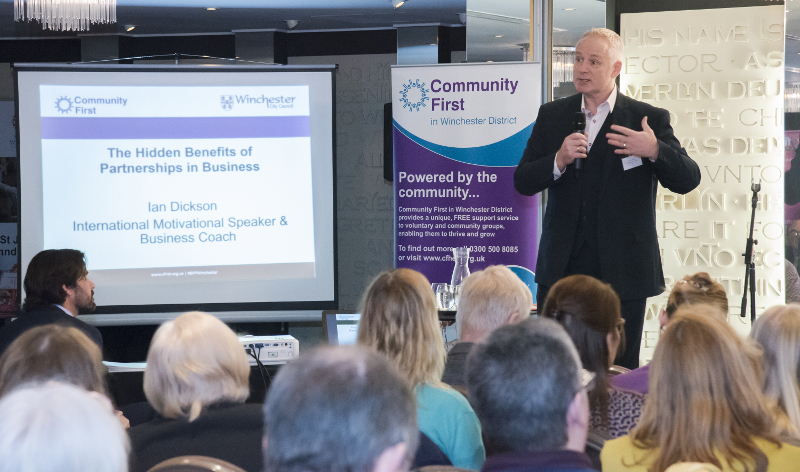 Business support for charities goes a lot further than corporate sponsorship, as charity and business staff discovered on 14th March 2019 at Community First’s Building Perfect Partnerships event supported by Winchester City Council. 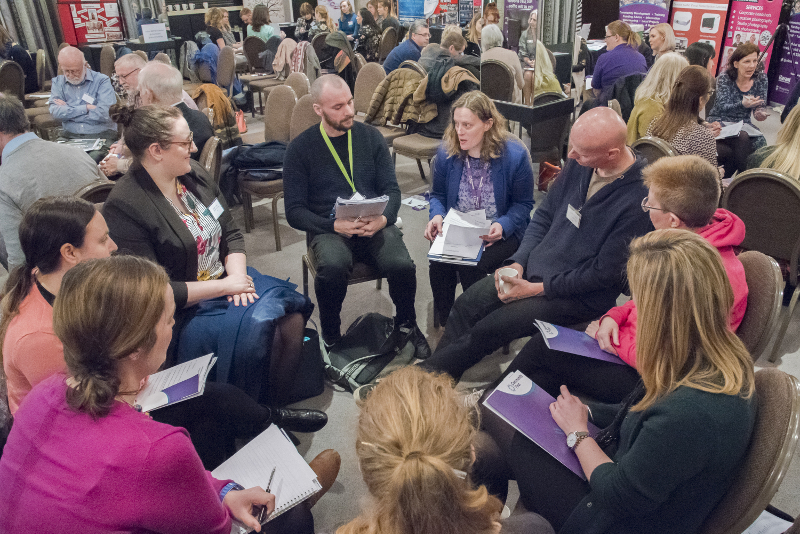 Over 80 delegates from charities, not-for-profits, social enterprises, and businesses from Winchester District attended the event at Winchester Hotel, to explore the untapped potential of turning to each other. Wellbeing coach Caroline D’ay shared her insights into how employee wellbeing and workforce motivation go hand in hand. This provided food for thought for both charities and businesses, as the event went on to consider the team building benefits of partnership working. International motivational speaker and business coach Ian Dickson imparted more hidden advantages to be found in charity-business relationships. During this segment, audience members were invited to retrieve tips and insights concealed inside bags of chocolate buttons. Ian identified mutual benefits including expanded networks, an uplift in referrals, and marketing together. 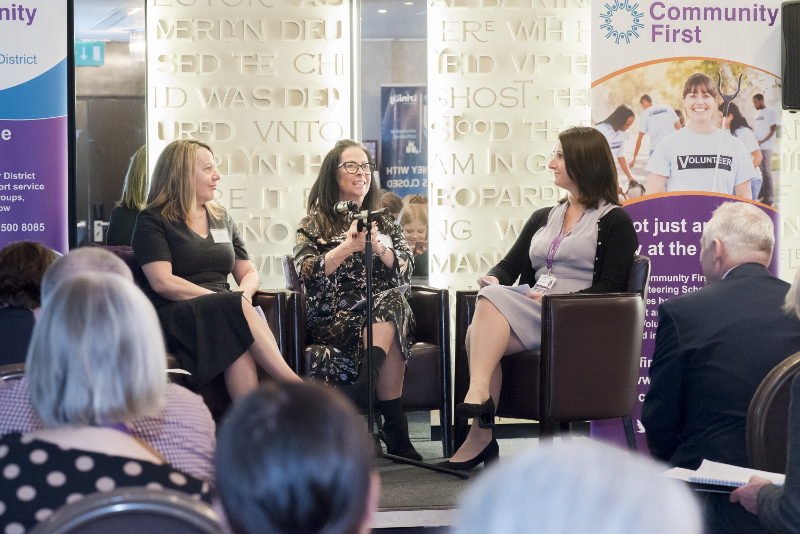 CEO of homelessness charity Trinity Winchester, Sue McKenna, and Linda Stiles, Sales and Marketing Manager at telecoms company ElemenTel, were interviewed together on stage. Sue McKenna’s advice to charities was “Don’t be afraid to ask” for the specific support they need. 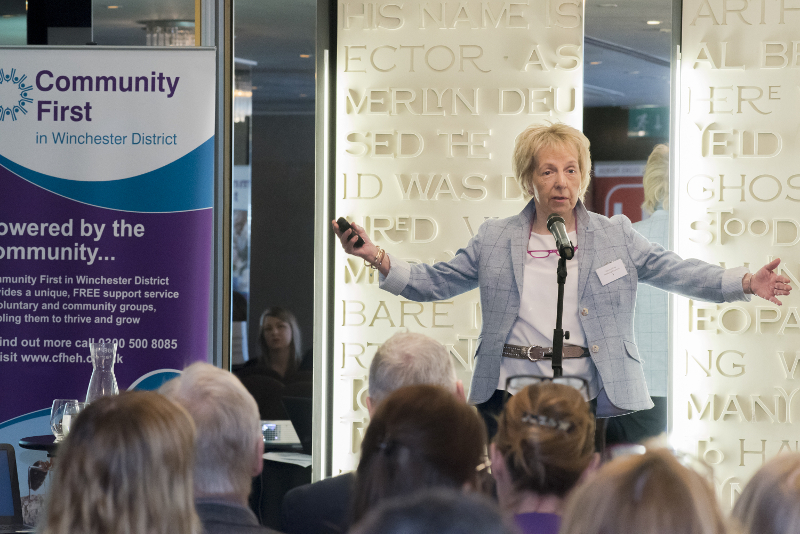 She also shared some important tips on helping businesses to feel connected to charitable causes. Trinity’s presentation showed businesses offering voluntary practical support to the charity during a day event that lifted the volunteers’ spirits and provided a space to meet new contacts. Linda Stiles spoke about the business advantages of working with charities, including brand development and team building opportunities. She also recalled her positive experience attending Community First’s business volunteer away day: “We won our battle with the brambles”, she said, reflecting on the unique opportunity to network while tackling a shared challenge. If you would like to engage your business with a charity, or you are seeking business support for your charitable organisation, you can find out how to get started by contacting Janet Duggan, Community First’s Business & Volunteering Engagement Manager: janet.duggan@cfirst.org.uk or Rachel Taylor, Business Volunteer Co-ordinator: rachel.taylor@cfirst.org.uk. 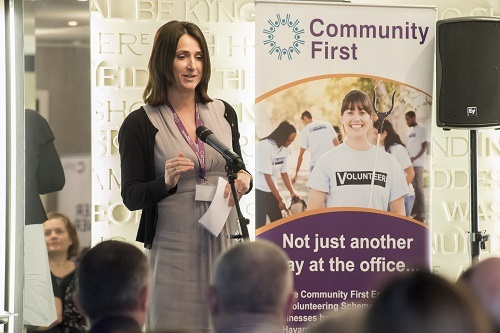 Find out more about how Community First works with businesses here. Visual recording of the event illustrated by Emma Paxton of Imagistic. Click the image to download the full-size version.